Generate anti-aliased line pixel coordinates. Generate coordinates of pixels within polygon. Generate coordinates of pixels within ellipse. 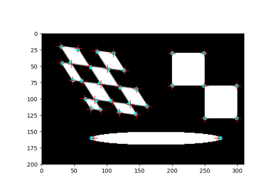 Generates ellipsoid with semimajor axes aligned with grid dimensions on grid with specified spacing . Calculates analytical surface area and volume for ellipsoid with semimajor axes aligned with grid dimensions of specified spacing . Generate coordinates of pixels within circle. Generate anti-aliased circle perimeter coordinates. Set pixel color in the image at the given coordinates. 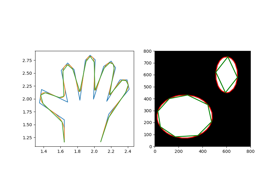 Generate an image with random shapes, labeled with bounding boxes. Generate coordinates of pixels within a rectangle. Generate coordinates of pixels that are exactly around a rectangle. Indices of pixels that belong to the line. May be used to directly index into an array, e.g. img[rr, cc] = 1. 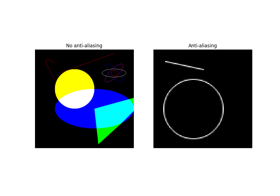 Anti-aliased line generator is available with line_aa . 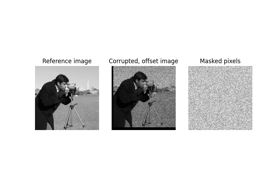 Indices of pixels ( rr , cc ) and intensity values ( val ). img[rr, cc] = val. Coordinates of the first control point. Coordinates of the middle control point. Coordinates of the last control point. Middle control point weight, it describes the line tension. Image shape which is used to determine the maximum extent of output pixel coordinates. This is useful for curves that exceed the image size. If None, the full extent of the curve is used. Indices of pixels that belong to the Bezier curve. May be used to directly index into an array, e.g. img[rr, cc] = 1. The algorithm is the rational quadratic algorithm presented in reference . Row coordinates of vertices of polygon. Column coordinates of vertices of polygon. Image shape which is used to determine the maximum extent of output pixel coordinates. This is useful for polygons that exceed the image size. If None, the full extent of the polygon is used. Pixel coordinates of polygon. May be used to directly index into an array, e.g. img[rr, cc] = 1. 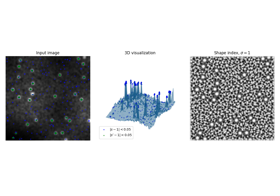 Image shape which is used to determine maximum extents of output pixel coordinates. This is useful for polygons that exceed the image size. If None, the full extents of the polygon is used. Whether to clip the polygon to the provided shape. If this is set to True, the drawn figure will always be a closed polygon with all edges visible. Minor and major semi-axes. (r/r_radius)**2 + (c/c_radius)**2 = 1. Image shape which is used to determine the maximum extent of output pixel coordinates. This is useful for ellipses which exceed the image size. By default the full extent of the ellipse are used. Pixel coordinates of ellipse. May be used to directly index into an array, e.g. img[rr, cc] = 1. Major axis orientation in clockwise direction as radians. Image shape which is used to determine the maximum extent of output pixel coordinates. This is useful for ellipses that exceed the image size. If None, the full extent of the ellipse is used. Indices of pixels that belong to the ellipse perimeter. May be used to directly index into an array, e.g. img[rr, cc] = 1. Length of semimajor axis aligned with x-axis. Length of semimajor axis aligned with y-axis. Length of semimajor axis aligned with z-axis. Spacing in (x, y, z) spatial dimensions. If True, returns the level set for this ellipsoid (signed level set about zero, with positive denoting interior) as np.float64. False returns a binarized version of said level set. Ellipsoid centered in a correctly sized array for given spacing . Boolean dtype unless levelset=True , in which case a float array is returned with the level set above 0.0 representing the ellipsoid. 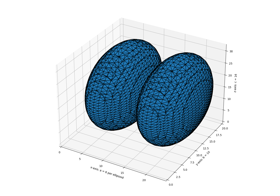 Calculated surface area of ellipsoid. Image shape which is used to determine the maximum extent of output pixel coordinates. This is useful for circles that exceed the image size. If None, the full extent of the circle is used. Pixel coordinates of circle. May be used to directly index into an array, e.g. img[rr, cc] = 1. 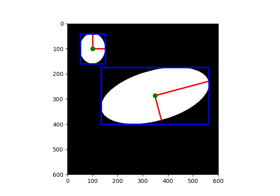 Bresenham and Andres’ method: Indices of pixels that belong to the circle perimeter. May be used to directly index into an array, e.g. img[rr, cc] = 1. Andres method presents the advantage that concentric circles create a disc whereas Bresenham can make holes. There is also less distortions when Andres circles are rotated. Bresenham method is also known as midpoint circle algorithm. Anti-aliased circle generator is available with circle_perimeter_aa . J.E. Bresenham, “Algorithm for computer control of a digital plotter”, IBM Systems journal, 4 (1965) 25-30. E. Andres, “Discrete circles, rings and spheres”, Computers & Graphics, 18 (1994) 695-706. Wu’s method draws anti-aliased circle. This implementation doesn’t use lookup table optimization. X. Wu, “An efficient antialiasing technique”, In ACM SIGGRAPH Computer Graphics, 25 (1991) 143-152. Note that this function modifies the color of the image in-place. Coordinates that exceed the shape of the image will be ignored. Row and column coordinates of pixels to be colored. Color to be assigned to coordinates in the image. Alpha values used to blend color with image. 0 is transparent, 1 is opaque. The image is populated with random shapes with random sizes, random locations, and random colors, with or without overlap. Shapes have random (row, col) starting coordinates and random sizes bounded by min_size and max_size . It can occur that a randomly generated shape will not fit the image at all. In that case, the algorithm will try again with new starting coordinates a certain number of times. However, it also means that some shapes may be skipped altogether. In that case, this function will generate fewer shapes than requested. The number of rows and columns of the image to generate. The maximum number of shapes to (attempt to) fit into the shape. The minimum number of shapes to (attempt to) fit into the shape. The minimum dimension of each shape to fit into the image. The maximum dimension of each shape to fit into the image. 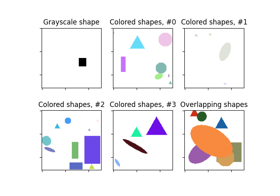 If True, the generated image has num_channels color channels, otherwise generates grayscale image. Number of channels in the generated image. If 1, generate monochrome images, else color images with multiple channels. Ignored if multichannel is set to False. The name of the shape to generate or None to pick random ones. The range of values to sample pixel values from. For grayscale images the format is (min, max). For multichannel - ((min, max),) if the ranges are equal across the channels, and ((min_0, max_0), … (min_N, max_N)) if they differ. As the function supports generation of uint8 arrays only, the maximum range is (0, 255). If None, set to (0, 254) for each channel reserving color of intensity = 255 for background. If True , allow shapes to overlap. How often to attempt to fit a shape into the image before skipping it. An image with the fitted shapes. A list of labels, one per shape in the image. Each label is a (category, ((r0, r1), (c0, c1))) tuple specifying the category and bounding box coordinates of the shape. Origin point of the rectangle, e.g., ([plane,] row, column). End point of the rectangle ([plane,] row, column). For a 2D matrix, the slice defined by the rectangle is [start:(end+1)]. Either end or extent must be specified. The extent (size) of the drawn rectangle. E.g., ([num_planes,] num_rows, num_cols). Either end or extent must be specified. A negative extent is valid, and will result in a rectangle going along the oposite direction. If extent is negative, the start point is not included. Image shape used to determine the maximum bounds of the output coordinates. This is useful for clipping rectangles that exceed the image size. By default, no clipping is done. The coordinates of all pixels in the rectangle. 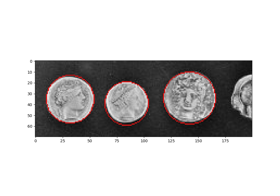 This function can be applied to N-dimensional images, by passing start and end or extent as tuples of length N.
Origin point of the inner rectangle, e.g., (row, column). End point of the inner rectangle (row, column). For a 2D matrix, the slice defined by inner the rectangle is [start:(end+1)]. Either end or extent must be specified. The extent (size) of the inner rectangle. E.g., (num_rows, num_cols). Either end or extent must be specified. Negative extents are permitted. See rectangle to better understand how they behave. Image shape used to determine the maximum bounds of the output coordinates. This is useful for clipping perimeters that exceed the image size. By default, no clipping is done. Whether to clip the perimeter to the provided shape. If this is set to True, the drawn figure will always be a closed polygon with all edges visible.